How A Spring Birthday Could Pose A Risk For Multiple Sclerosis : Shots - Health News Babies born in London in May have less vitamin D and more of a certain type of immune cell in their blood than babies born at other times. Researchers say the differences might help explain why people born in the spring are more likely to get multiple sclerosis. 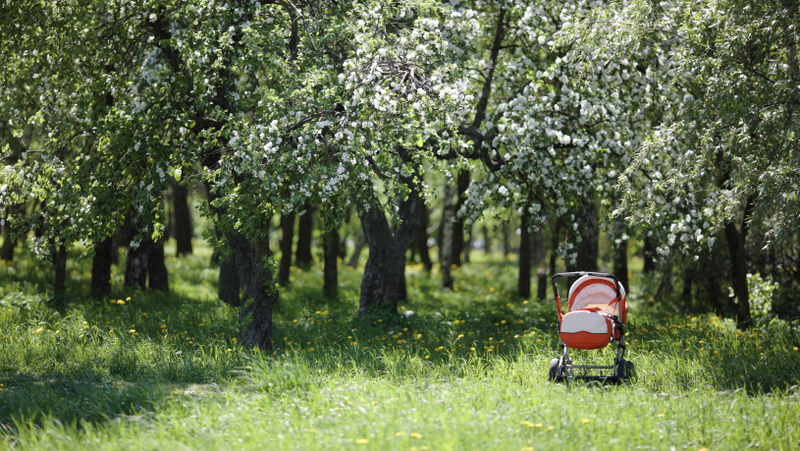 Spring has brought the stork and a baby who just might have a higher risk for multiple sclerosis later in life. There's lots of science trying to connect a baby's birth date to health later in life. It's usually about serious diseases that have no clear cause, like schizoprenia, autism and multiple sclerosis. And it's almost all junk science, the medical equivalent of astrology. That's because though studies have shown a correlation between season of birth and disease for MS and other disorders, they've never been able to show how seasonal differences in people's bodies or the environment could cause disease. Scientists in England say they've taken a step closer to that, showing that babies born in May have lower levels of vitamin D in their blood at birth, and more circulating immune cells, than do babies born in November. "I'm convinced," says Sreeram Ramagopalan, that the lack of vitamin D is a risk factor for multiple sclerosis. Ramagopalan is a researcher at the University of Oxford who led the study. He's been trying to find genetic and environmental causes of MS, which damages the covering on nerves, and can cause problems with movement, vision and thinking. MS researchers have been looking at birth season and vitamin D because the disease is much more common in latitudes with little sunlight in winter, such as Scandinavia, the United Kingdom and Australia. Less sunlight for Mom means less vitamin D in her blood for the baby in the works. A low level of vitamin D could affect the developing immune system. The researchers tested blood collected from 100 newborns in hospitals around London. The researchers measured T cells, immune system cells that are formed in the thymus gland. They found that the May babies had twice as many T cells in their blood as did the November babies., and 20 percent less vitamin D.
Ramagopalan speculates that some sort of imbalance or lack of regulation of the T cells might increase the risk of developing MS later in life. "These could potentially trigger a response against myelin in the brain," he told Shots. The results were published in JAMA Neurology. But there are lots of dots that remain to be connected here. There's no proof that the lower levels of Vitamin D could be causing the immune cell differences, for instance.. But multiple sclerosis researchers and patients have become increasingly interested in lack of vitamin D as a potential cause. "There's been a lot of buzz in the community," says Nicholas LaRocca, a vice president at the National Multiple Sclerosis Society. A 2011 study in Australia found that lack of vitamin D and lack of sun exposure were both risk factors for nerve damage, which can be an early symptom of MS. The National Multiple Sclerosis Society is now funding a randomized clinical trial to see if giving 600 IU or 5,000 IU of vitamin D to people with MS can slow progression of the disease. Vitamin D has been the "it" supplement of late, with partisans suggesting that large doses of it can prevent or cure a host of diseases, including cancer and heart disease. But U.S. authorities, including the Institute of Medicine and the US Preventive Services Task Force, have been more cautious, saying that there's little evidence of any effect. Ramagopalan admits that there's a lot of hype around vitamin D and disease prevention. "I don't think it's linked to everything." But he thinks that healthy adults should be taking 5,000 international units a day of D, just in case. "We need that much vitamin D," he says. That's far more than the 600 IU a day for adults recommended by the Institute of Medicine in 2010, and above the institute's 4,000 IU upper limit. So this is definitely one of those "stay tuned" issues. With luck the increased interest in vitamin D and disease, for MS and many others, will shake loose funding for randomized clinical trials that will do a better job of finding out if D is really a factor.